I don't know why they call this a tower in the headline, but whatever. 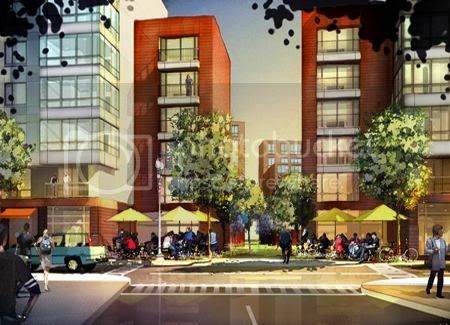 CAMBRIDGE, MA - Kendall Square will soon have another luxury apartment and condominium community amid its biotech core. Joint partners Extell Development Co. of New York and Chicago-based Equity Residential have broken ground on a 531-unit, $225 million complex at 303 Third St. The apartment building will be located across the street from biotech giant Genzyme Corp.?s headquarters. Plans call for the construction of two buildings, with 292 apartments in one and 239 condominiums in the other. Each building will have ground level retail separated by a one-acre courtyard. The project, which is not yet named, is set to be completed in 2008, says Chris Reilly, area vice president for Equity Residential. 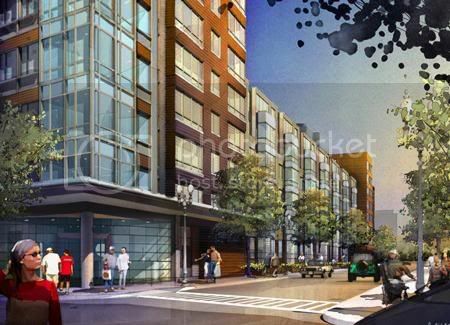 The complex is the third in the Boston area under development by Equity. 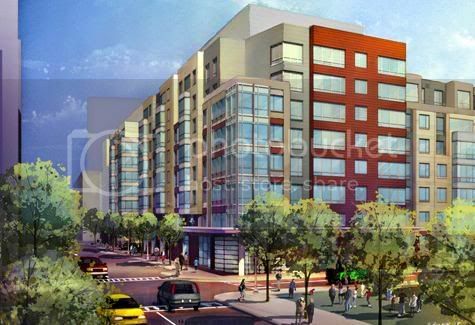 In June, the company broke ground on a a five-building, $160-million, 310-unit property near the banks of the Charles River called the Equity Residential Development at Emerson Place. That development is the first along the Charles River in 25 years, Reilly says. Equity also is building 120 units of senior housing in Westwood. 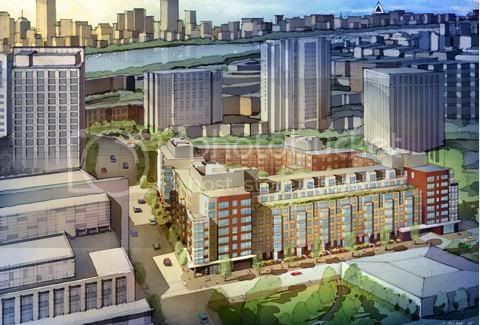 Extell, the developer of the Intercontinental Boston, could not be reached for comment. Equity and Extell?s latest Cambridge venture, designed by New York architect Centra/Ruddy, is just the latest in a string of residential buildings popping up around Kendall Square. The area has been long-known as a high tech epicenter because of its proximity to the Massachusetts Institute of Technology and Harvard Square. The location of those schools along with hundreds of nearby offices, a rapid transit stop and a city master plan that calls for the creation of a theater complex in the area, makese Kendall Square one of the hottest development sites in Cambridge. Watermark residences, a 24-story, 321-unit luxury tower located across the street from the Equity and Extell venture, was completed earlier this year by Twining Properties, of New York, at a cost of about $100 million. Twining also is planning a 20-story tower with 123 residences costing $70 million as part of Watermark?s second phase. This tower will soar to eight stories ! Looks good but I think an actual tower would look better. This seems like a great place for MIT to build student housing. Too short, and too bricky. Twining also is planning a 20-story tower with 123 residences costing $70 million as part of Watermark’s second phase. What is this all about? I wasn't aware of any additional phases to Watermark. Does this mean the Constellation Center is out? What is this suburban BS? I sick of these wasted opportunities. Who needs a courtyard when you have the Charles River right there? I don't see why this development would have any effect on Constellation Center. And what do you mean by 'suburban'? This building appears to hug the streets on all sides. What needs to happen now is similar development on the other sides of those streets. By 'suburban' I mean it is short and squat, relative to it's neighbors. It doesn't 'fit' in to the neighborhood. I suppose it builds up a nice street wall though. Really? Walk a couple blocks north and you're in the land of two and three-story wood-frame houses. This is a lot of things, but it is not suburban. Depends what's on the ground floor. Whether it's good urban or crappy urban depends on what's on the ground floor. If your definition of suburban is crappy urban, then I suppose I agree with you. Perhaps I was quick to judge, but it could be taller and have a better design. I don't see why you'd want it to be taller. Who doesn't want it to be taller. Isn't that what we've been preaching on this board all along? I guess the article's headline threw me off when I saw the word 'tower'.